Ukraine | Break It And Learn! This was a priceless experience for many reasons, the most memorable of which I will not detail here! Yes, our site was pretty remote. It kind of reminded me of the time my friends and I had to take a jeep-boat-jeep to get to Arenal in Costa Rica. There were bumpier roads there, but this involved a scarier airplane ride in ancient Soviet-era aircraft! No wonder Ukrainian claps when they land! It’s a miracle! It’s a miracle! We’ve landed safely! It’s a wonder these things can still fly. Wire coat hangers? Yes, but also duct tape? Yeah, you know how it looks suspicious when you’re toting around duct tape, rope, and latex gloves in the trunk of your car? I was wondering if the airport security would think it was strange for me to be toting all of that – and more – in my luggage. But thankfully, I was not flagged. Funny, I remembered the duct tape, but I forgot the drafting tape!But that duct tape came in handy for fixing the outdoor shower at Dacha 1 – headquarters, if you will – where we had most of our meals and did much of our work. We had an indoor bathtub infested with flies at Dacha 9 where I stayed, but they had an outdoor shower with walls essentially made of black garbage bags – walls that were ripped during the archaeologists’ end-of-season bash. I don’t know why they thought masking tape would be able to reanneal the plastic pieces back together… But duct tape to the rescue! I wish I had taken a picture of that patched up shower. My friend has said that whomever I marry – if I ever marry – had better know his way around tools, otherwise I’d have no respect for him! She is absolutely right. So… Why were we in Ukraine, and who are “we”? Well, for “official” information, visit Studio Ukraine. My professor Hope has a comprehensive synopsis with our studio goals detailed. In essence, some people in Ukraine want to build an archaeological park on a semi-secret 240-hectare plot of land on the Crimean Peninsula. Our studio (minus me now… I didn’t get a chance to update the list of students on the website before I left the program…) is involved in generating concept and design ideas and strategies that incorporate the many ancient Greek, Roman, and Byzantine ruins, including ancient farmhouses, that are scattered throughout the site. 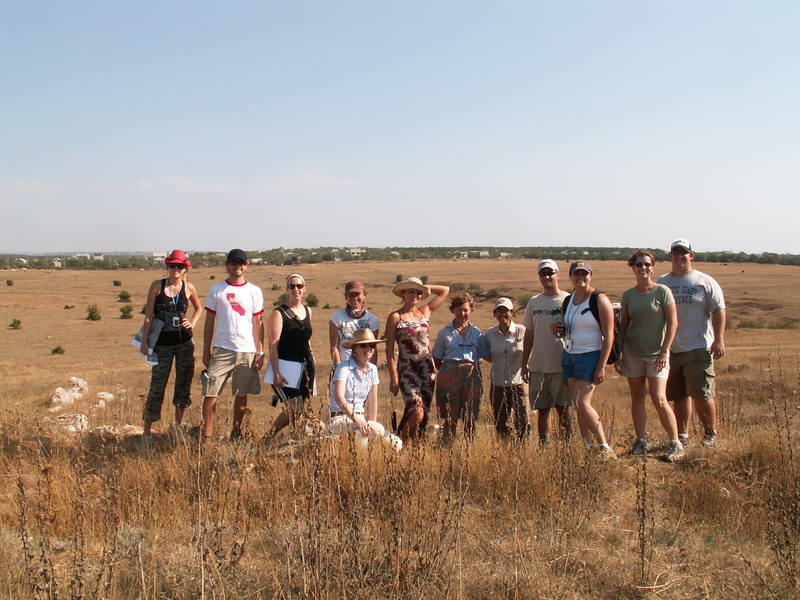 Half of my class travelled to Ukraine with my professor on an almost two-week long journey and adventure (poor Hope!). But you know what? As a whole, I think that trip to Ukraine (of all places) topped the Europe and Netherlands trips I had taken earlier this same summer. How strange is that??? And I’m just realizing that right now as I’m typing this… Hmm… Something I have to delve into for myself. Yeah, but it DOES top Europe and the Netherlands. Oh, nothing can compare to the ancient architectural marvels of Rome or Florence… Or even their contemporary counterparts in Amsterdam or Rotterdam… What very opposite ends of the spectrum! But yes… Something about the experiences that I’ve taken back from Ukraine makes that the trip that I most cherish, if forced to rank them. And yes, I DO oddly use the word “cherish.” It’s an apt word! Not that I didn’t enjoy exploring Europe with some of my closest friends or making new friends in UT’s School of Architecture in the Netherlands. Not at all! I will always treasure those fond memories, too. My typical day in Ukraine consisted of waking up on a thin little mattress that thankfully did not have bedbugs (we were forewarned that it might) and emerging from my mosquito net. The mosquito nets prevented the swarms of flies from nibbling at our toes the whole night (see videos on this WordPress site and photos in Picasaweb). I washed up and slowly made my way down the hill from Dacha 9 to Dacha 1. We lived in an archaeological preserve, the National Preserve of Tauric Chersonesos, and my classmates and I were divided into three different dachas or houses, Dachas 1, 3, and 9. From Dacha 9 I walked past the shooting range and across one of the sites that the archaeologists were excavating down to Dacha 1 where we would often convene to start the day. We’d often sit in on lectures given by our U.S. or Ukrainian colleagues about our project. Then off for our site visit, where we would scour the land, maps in one hand, Sharpies in the other! This is a complex project for more reasons than one. Some preliminary analyses are on the “official” website. Then after a hot, grueling afternoon under the relentless sun, a dip in the Black Sea! The fastest way to cool down when there is little A/C around. Ah, the memories… Many interesting ones and many cherished ones. :D I’m looking forward to seeing what comes out of this project. ah – so nice! wait what do you do again? apt take on the experience — thank goodness you didn’t have to deal with bed bugs!